Eds. note: This graphic novel--like many in the genre--can be used with a wide range of ages, from students in middle grade, on up to college. Comics! Graphic novels! Are you reading them? You should be! They're outstanding... for what you can learn about! Years ago, I learned about the Code Talkers. I don't recall when or how, but I knew about them. With each year, a growing number of Americans are learning about who they were, and their role in WWI and WWII. A few years ago, I started reading about comic books--written by Native people--about Code Talkers. Then, I got a couple of those comic books and was deeply moved by what I read. The two that I read (described below) are in Volume One of Tales of the Mighty Code Talkers. Given the popularity of graphic novels, Tales of the Mighty Code Talkers is an excellent way for teens to learn about the Code Talkers--from people who are Native. That page warms my heart. So many of my relatives were--and are--in the service. They are people whose ancestors fought to protect their families and homelands. The code talkers, like soldiers everywhere, were/are... husbands. Wives. Parents. Children... on homelands, or, carrying those homelands in their hearts. That seemingly obvious fact is brought forth in the stories in Tales of the Mighty Code Talkers. In the prologue--Homeplace--we read the words of Lee Francis III. He founded Wordcraft Circle in 1992 to promote the work of Native writers and storytellers. He passed away in 2003. Where, I wondered, was Homeplace first published? After poking around a bit, I found it in his son's doctoral dissertation. That son, Lee Francis IV, founded Native Realities Press. 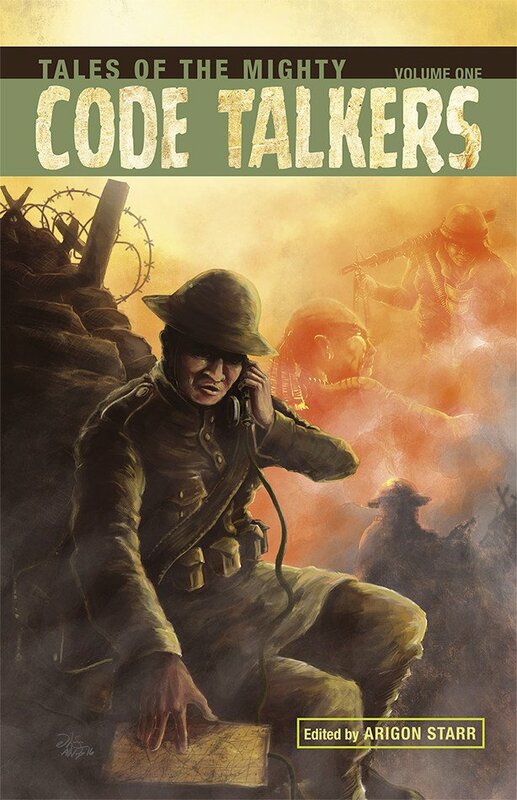 Tales of the Mighty Code Talkers is published by that press. Knowing all this gives this collection depth and a quality that is hard to put into words. It is something to do with family, community, nation, conflict, commitment, perseverance... shimmering, with love. After Homeplace, is Roy Boney's We Speak in Secret, which I read/reviewed as a stand-alone in December of 2014 and Arigon Starr's Anuuma Luma. They're followed by several others that expand what we know. Did you know, for example, that Native women were in those wars? That may seem obvious, too, but one story in Tales of the Mighty Code Talker focuses on a Native woman. Code: Love by Lee Francis IV is about Sheila, a Kiowa woman who is a nurse. A soldier is brought to the field hospital where she's working. His eyes are bandaged. She's walking past and hears him call out for tohn. She approaches his bed, but a guard stops her because that soldier is "some sort of radio man. Command wants him under guard." Sheila's mind goes back home--to Anadarko, Oklahoma--as she remembers a boyfriend who enlisted in the war. This injured soldier, we understand, is a Native man speaking his language, and thinking of his own home. Of course, Sheila figures out a way to get him some water. Each story in Tales of the Mighty Code Talkers is memorable. I highly recommend it to teachers, everywhere. Libraries ought to get several copies. We Speak in Secret, written and illustrated by Roy Boney, Jr. Native America Calling's segment on December 14 was all about Tales of the Mighty Code Talkers. One of the early callers was a Tlingit man, calling in from Alaska, to say that there were Tlingit code talkers, too. In response to his call, Arigon Starr said that his story is precisely why Tales of the Mighty Code Talkers is subtitled "Volume One." There's more to know. I look forward to Volume Two. In the meantime, get several copies of Volume One, directly, from Native Realities Press.